The city of Thiers in central France has been affectionately referred to as the country's cutlery capital for over six centuries. So it comes as no surprise then that the world's most beautiful and expertly crafted cutlery would hail from this region. When it comes to Andre Verdier cutlery, you can come to expect nothing less than perfection. Established in Celles sur Durolle, near Thiers, each piece of Andre Verdier cutlery has been carefully designed with a unique amalgamation of traditional know-how and innovative production techniques. One look at this exquisite Oyster Shucking Set and the workmanship is clear. 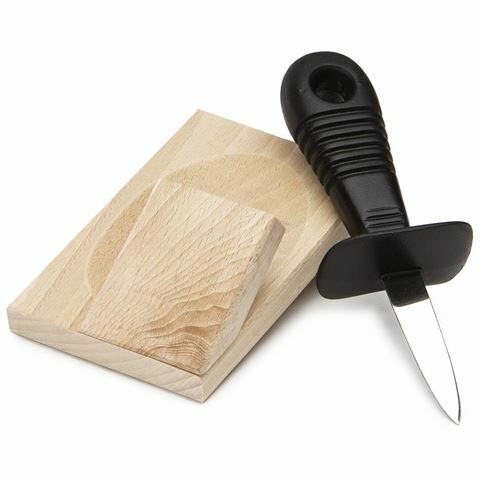 The French made wooden block and stainless steel knife work together simply and efficiently, allowing you to savour the fruits of the sea and protect your hands in the process. Simply place oyster in groove and use the knife to pry it open. The wooden block will keep the oyster in place while you work. Open wooden fender suits oyster shells of all sizes.